Later this year, Michigan voters will elect a new governor, a new attorney general, a new secretary of state and multiple new U.S. House members. They’ll also fill every seat in the state Legislature and pick a U.S. senator. The election will likely be among the most expensive in state history. Here are 10 graphs looking at trends to watch in 2018. Political action committees (PACs) help fuel campaigns. They raise money from their supporters and then spend it to support candidates they like. When it comes to giving money directly to candidates, PACs can give 10 times what individuals can give. 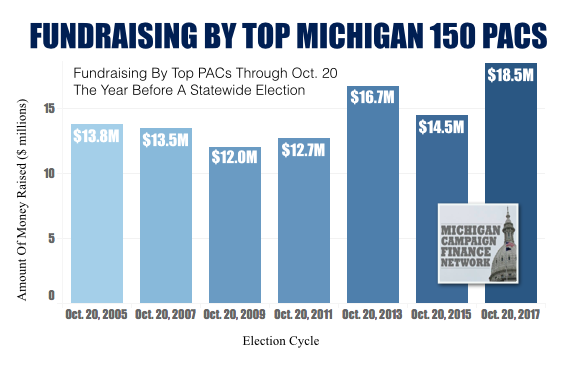 So it’s noteworthy that Michigan’s largest 150 political committees were on a record fundraising pace as of Oct. 20, 2017. That means they could have more money available to give to candidates in 2018. Caucus committees have been helping drive up the political committees’ overall fundraising number. 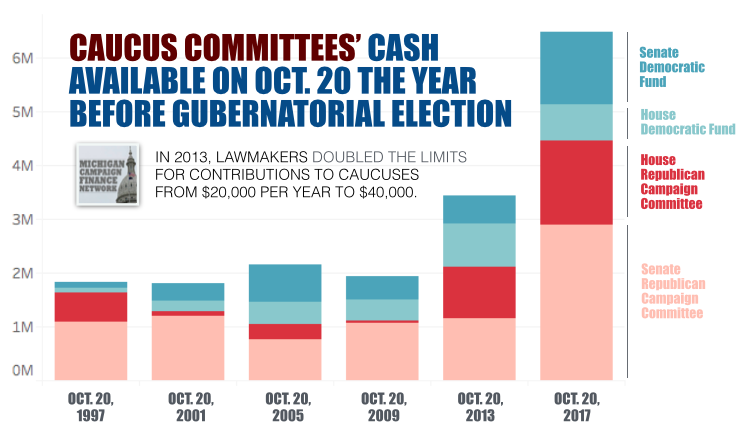 Caucus committees raise money on behalf of the four legislative caucuses and then spend the money in the most competitive state legislative races. As of Oct. 20, the four caucus committees had a record amount of money available — thanks in part to new contribution limits approved in 2013. Super PACs can raise unlimited amounts of money from corporations and labor unions. Already, 12 Super PACs are among the the top 150 PACs this election cycle. But you can expect more Super PACs to be on the list by the end of the year. 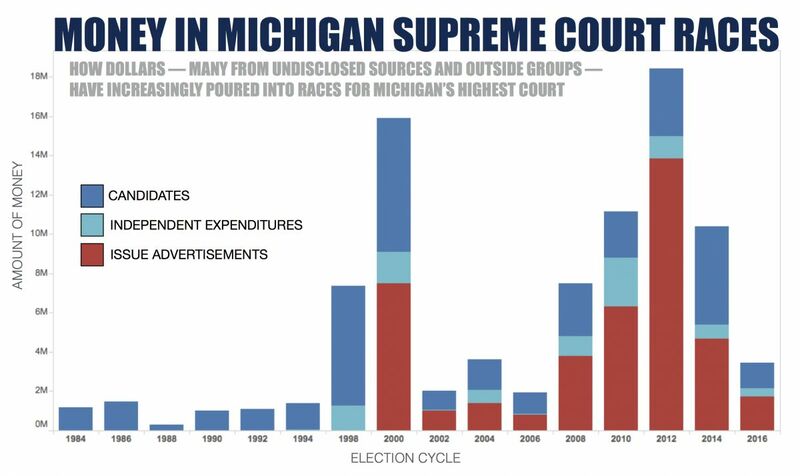 Michigan’s last gubernatorial election year saw more new Super PACs form — 34 — than any other year since the Supreme Court's 2010 Citizens United decision, which allowed Super PACs in Michigan. Super PACs and other groups that spend money to sway voters outside of the umbrella of candidates’ campaigns have been driving up the cost of key races nationally. The 2014 race for governor in Michigan is an example. 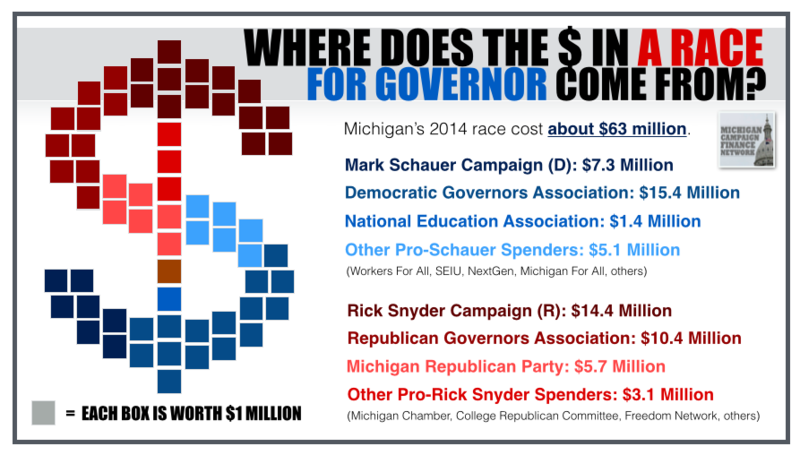 In 2014, the Republican Governors Association and the Democratic Governors Association — two national groups that can raise unlimited amounts of money — spent more on TV ads in Michigan than the two candidates’ campaigns spent overall. 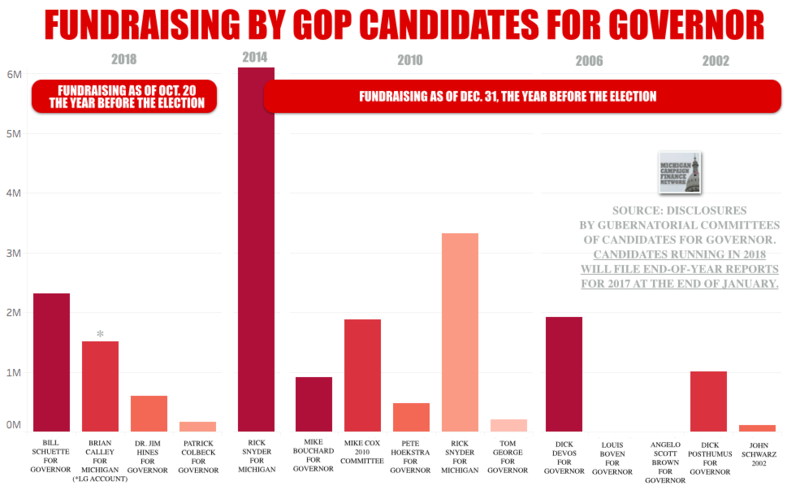 As of Oct. 20, 2017, the fundraising by declared candidates for governor fell somewhere in the middle of what past candidates for governor had raised by the end of the year before the election. In previous election cycles, candidates for governor didn’t have to file a disclosure in October. The GOP candidates were out-raising many past GOP candidates but not Gov. Rick Snyder. The Democratic candidates were out-raising many past Democratic candidates but not former Gov. Jennifer Granholm. 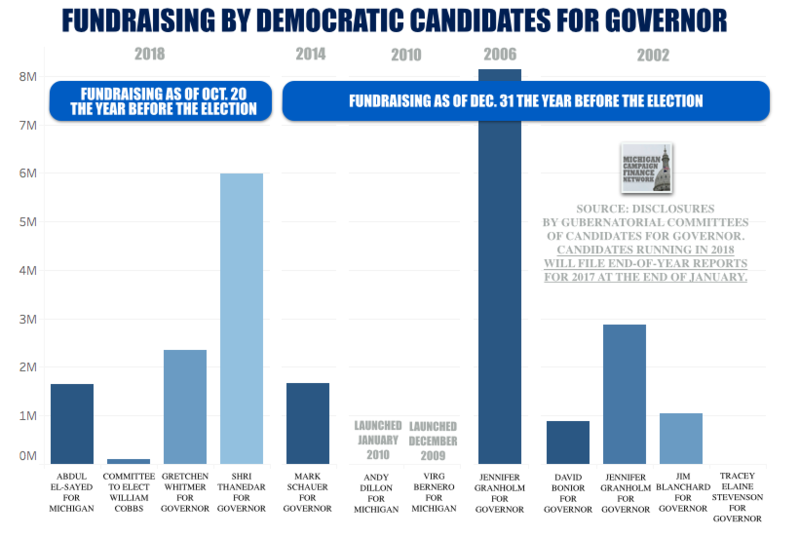 Things could change because the 2018 candidates will disclose new fundraising numbers at the end of the month. Another potential trend to watch in 2018 is the rising number of people taking steps to run for office. When candidates begin raising money to campaign for a state office, they have to form an official candidate committee. 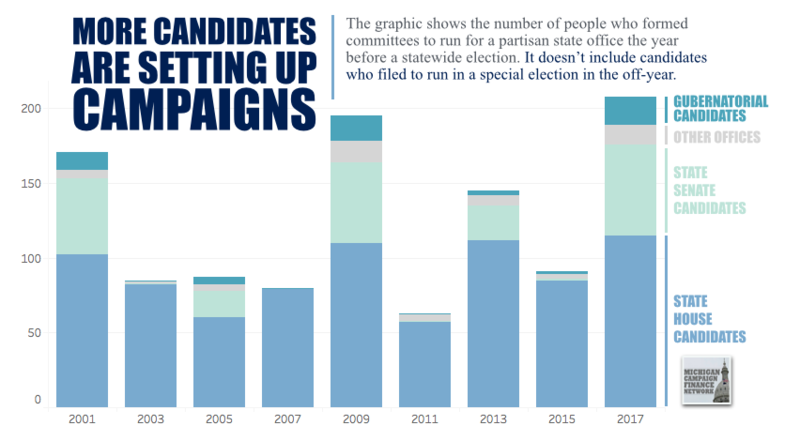 More candidates filed that paperwork in 2017 than had in past non-election years — these numbers don’t include candidates running in special elections. One reason more people are forming committees early could be the cost of campaigns is going up. As an example, the overall cost of State House races in 2016 was a record. 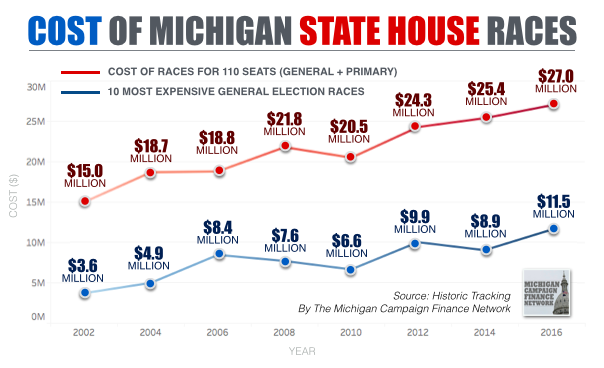 The Michigan Campaign Finance Network tracked $27 million in spending aimed at influencing state House races that year. 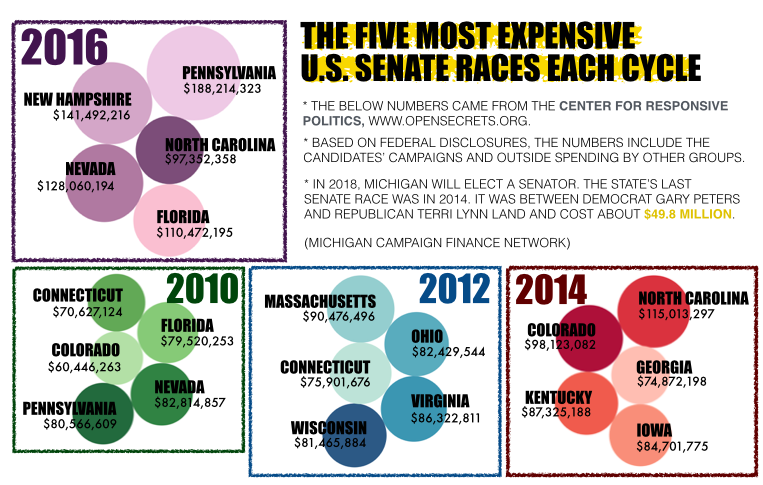 About $11.5 million — or 42 percent — went to the 10 most expensive general election races. Unlike 2016, Michigan will see a U.S. Senate race in 2018. Nationally, the cost of the most competitive U.S. Senate races has jumped upward in the last few election cycles, according to data from the Center for Responsive Politics. So if the Republican candidate catches on against incumbent Sen. Debbie Stabenow, a Democrat from Lansing, the race could get pricy fast. The 2016 and 2014 statewide elections in Michigan saw relatively little activity when it came to statewide ballot proposals. In 2012, however, when there were six proposals on the ballot, ballot committees raised about $154 million. As it stands, numerous committees have been raising money — three have raised more than $1 million — with hopes of getting their proposals passed in 2018. 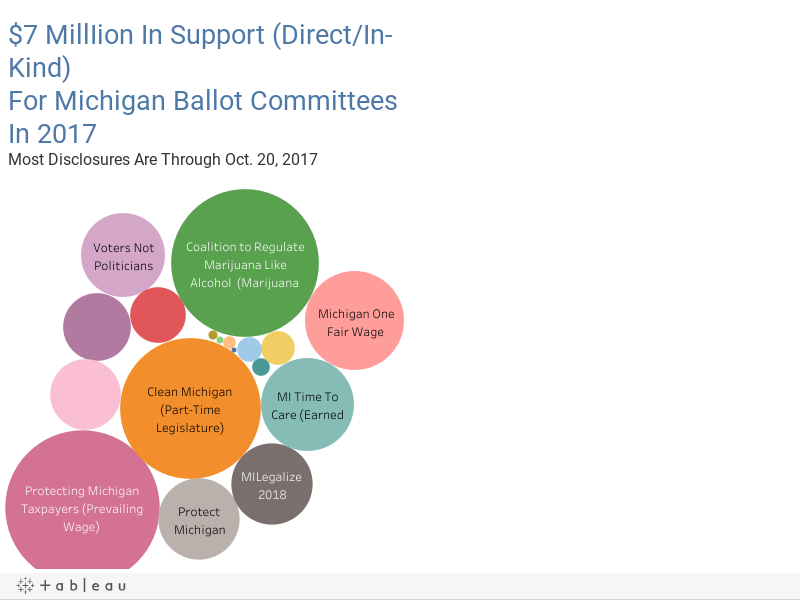 Scroll your mouse over the circles below to see how much various active ballot committees have reported raising so far. Two seats on the Michigan Supreme Court will be up for election in 2018. If the past few cycles are any indication, the cost of the races could fall somewhere between a few million dollars and more than $10 million. The 2016 election also saw two races for the Supreme Court. But because Democrats didn't make a strong effort to unseat the two GOP-nominated incumbents, the races were the least expensive in a decade.